There is so much to write about breakfast that I think it will take a couple of posts. Here is part 1. It is important to 'break the fast' and start the day with some nutritious food. In Western countries such as Australia, the breakfast food of choice is often boxed cereal. Although this choice is definitely an easy option, it deserves careful consideration. 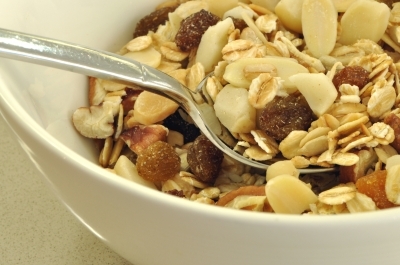 Most (if not all) commercial breadfast cereals are a very processed food. The majority are based on a grain, or combination of grains, however the finished product looks nothing like the plant food it contains! Many cereals also have vitamins added back into the food, suggesting that it has been very refined. Brands that are labeled 'high energy' will often only be high in sugar. A much better choice for a grain based breadfast is where you can actually recognise the food, such as oats used in porridge or muesli. Many people don't realise, however, that most grains, including oats, require cooking or soaking to make them more digestible. Bircher muesli is soaked overnight in milk, water or juice. If you don't soak muesli over night, then in the morning pour a small amount of boiling water over the muesli in a bowl and let it soak for about 15 minutes. Add fresh fruit and yoghurt. Toast is the other breakfast staple. However, spongy white bread is not a good food to start the day as it is very refined. Ideally choose bread made from sourdough, with wholegrain flour. The more dense and grainy bread is, it is generally higher in fibre, and a better product. Avoid bleached flour, bread improvers, and other additives in your loaf. Some great toppings for toast include: avocado, poached egg with rocket or spinach, sardines, organic baked beans. Of course, there is a whole world of ideas out there for breakfast that do not include cereal or toast. Come back tomorrow, and we'll explore some of them.